We study bacteria, the simplest free-living single-celled organisms. We are interested in how they sense changes in their environment, analyze sensory data, and respond in a purposeful manner. Our quest is an understanding of behavior at the molecular level, especially behavior involving chemical stimuli (chemotaxis). Our primary subject is the peritrichously-flagellated bacterium Escherichia coli, that lives in your gut. We are trying to learn how its flagellar motors work, how their directions of rotation are controlled by the cell's sensory-transduction network, and what effect that rotation has on modes of flagellar propulsion. Our main interest is free-swimming cells, but we also study cells that swarm (swim in a coordinated manner over moist surfaces), or twitch (Pseudomonas) or glide (Cytophaga, Flavobacterium, Mycoplasma). 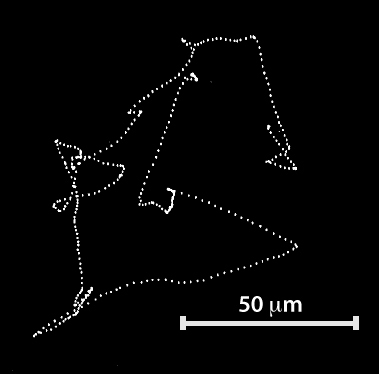 A projection of the track of a wildtype E. coli obtained with a microscope which automatically follows its motion in three dimensions.